On our perpetual hunt for the next best Happy Hour deal, we thought to check out Yakuza Lounge in Portland, which came highly recommended by a local foodie. The menu looked enticing and the space looked colorful and interesting, so we decided to give it a try. Situated in the budding NE Killingsworth area of Portland, Yakuza Lounge & Izakaya is sandwiched between some of Portland's great food establishments such as Beast and Expatriate. The neighborhood is laid back and certainly on the rise, as we noticed a lot of other interesting specialty shops, wine bars and restaurants that looked inviting. Yakuza is pretty large inside and is made up of mainly long communal tables, which are great to sit at with a big group of friends. In fact, we sat at the edge of one of these tables alongside a bigger party, which I thought may be distracting but turned out not to have an impact on our experience. Other things such as the sub-par service though, which I'll get to shortly, did have a major impact, however. Since Dan and I came for the happy hour special, we were only interested in that menu, but sadly weren't shown this offering at all until we asked for it several times. Eventually, we did receive the happy hour menu, spelled out on a crumpled postcard, reflecting different prices than their website, and this wasn't to our favor. After a quick look, we decided on the burger that Yakuza is so well known for, as we wanted to know what the hype was about. 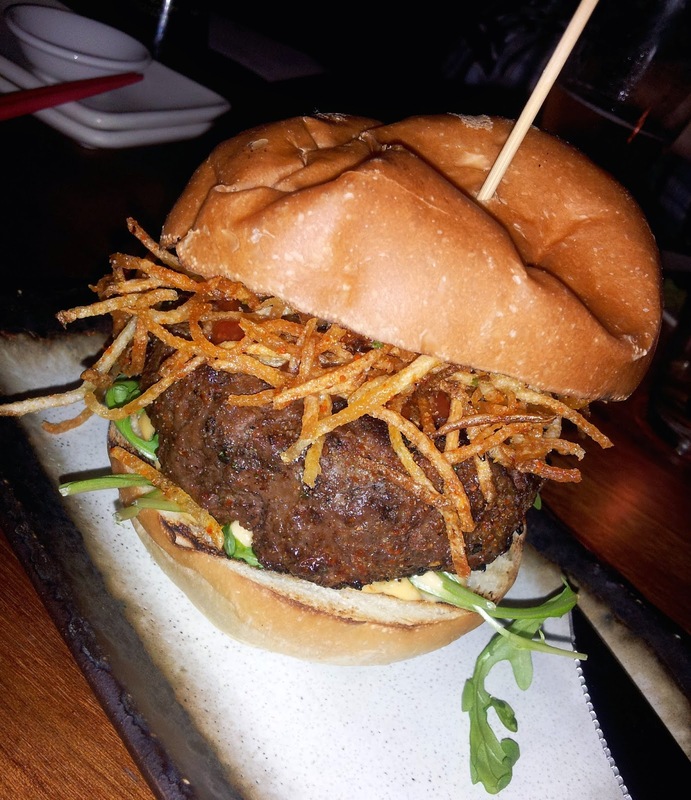 Yakuza Burger - As you can see from the above, the Yakuza burger is truly a thing of beauty. Generously plump, the meat is perfectly cooked and packs a ton of flavor, obviously made from great quality beef, which may even be grass fed. The toppings are simple but also very flavorful and innovative, such as the spicy mayo, fresh peppery arugula and the piece-de-resistance, shoestring fries that unapologetically protrude from the bun. Overall, the burger satiates and inspires the senses and is one of the better burgers I've had in town and in general. Speaking strictly from a food and flavor perspective, I highly recommend it. This is where our experience unfortunately goes sour. From the minute we walked in, we were treated curtly and sadly as if we didn't matter. No doubt making for an aggravating experience, all the servers at Yakuza were not only inattentive but downright neglectful and rude. True that they apologized for being "short staffed" and that the kitchen "was out of sorts," but their behavior spoke louder than words (i.e. ignoring our second request for water or us having to ask them explicitly why it took 40 minutes to get us our burger), they stroke out on many occasions. Dan and I began to seriously doubt our choice to come here in general, and to also sit in the main dining room. Next time (if there's a next time), we'll probably sit at the bar, where service is usually quicker. Costs are expensive for a happy hour experience, especially since the actual costs don't reflect what's advertised on the website. Our two burgers (not including drinks, which ended up being comped) set us back $18. Ehhh...not sure if we'll be back.